When things go wrong, and things happen, and people suffer: why? I am not a trained theologian, so what follows comes out of my reasoning and my plain reading of Scripture. You may have further comments or thoughts; hit reply to the email or post them as comments on the blog post.When things go wrong and we know why they went wrong, we can usually deal with it pretty well. It's when bad things happen and we don't know why that we start to ask questions. And as this often happens on the mission field, we need to have a framework for thinking about it--because we won't always know why, but we need to guard against jumping to (probably wrong) conclusions. There are lots of reasons why bad things happen to people. 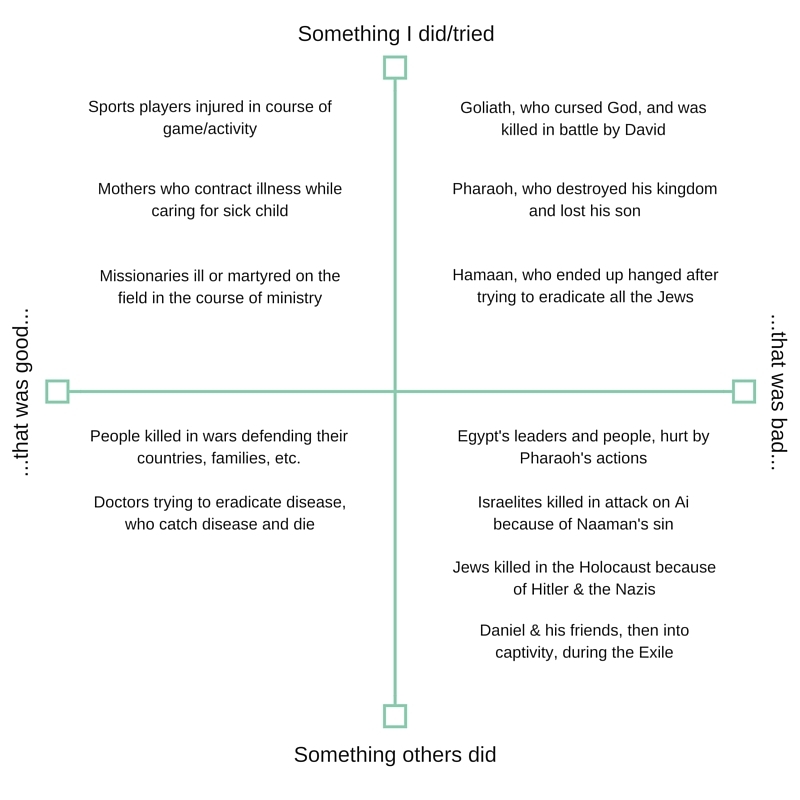 We can construct a 2-axis graph to see some of the categories, which illustrates some of the complexities: Some have been tempted to think, and even preach, that if we are doing the will of God we will be protected from all harm--and therefore, if something bad happens to an individual, it's because of their sin. In my view, this is a ridiculous idea. The chart above shows at least three categories where people are wounded through no fault of their own. Strongest of all is the category of people wounded in the course of doing something at least nominally good. If people play a sport (or even exercise), they run a chance of getting injured. If a man (or woman) undertakes service in his country's military, they run the chance of being wounded or killed. If someone becomes a doctor, they have the possibility of contracting an illness. We run calculated risks when trying to do great good, and often the greater good the greater the risk. Why should it be any different in God's service? And, there is another category not shown on the chart: random events. Peoples' theology will differ on this, but it's my general feeling that many times things happen for which no one is responsible. Hurricanes, tornadoes, and earthquakes are natural systems on the planet, and if people are in the way of these storms they will sometimes be killed. Disease, famines, and plagues can all be sent by God, but that doesn't mean they always are--we live in a broken world, and not every case of pneumonia or the common cold or widespread famine arises out of personal or corporate sin. When bad things happen, we hurt, and we weep, and we care for those who are wounded. But let us also think broadly about the benefits of bad things. If bad things never happened to good people, there would be no need for service and compassion for each other. If there was no risk, there would be no courage and no cost to follow Christ. "This, indeed, is probably one of [God's] motives for creating a dangerous world—a world in which moral issues really come to the point. He sees as well as you do that courage is not simply one of the virtues, but the form of every virtue at the testing point, which means, at the point of highest reality. A chastity or honesty, or mercy, which yields to danger will be chaste or honest or merciful only on conditions. Pilate was merciful till it became risky," writes C. S. Lewis in The Screwtape Letters. It doesn't reduce the present pain, but in the long run--in the light of eternity--the precise why of an event becomes less important than how we react to it. We sorrow over wounds and deaths now, but in 100-odd years every follower of Christ now wounded will be whole and alive and beyond pain forever more--justice will be done, deeds will be judged, rewards will be issued, wrongs will be righted. In that context, we may find God allows random evils now as trials and testings that grow spiritual fruit. James says something like this: "Count it all joy when you meet trials, for the testing of your faith produces patience. Let patience have its perfect work, that you may be perfect and complete, lacking nothing" (James 1:2-4). So, when we think about a "theology of suffering," we need to realize three things about service amongst the unreached: 1. If you put yourself in places where bad things happen to lots of people as a result of the evil actions of others, it's a good chance bad things will happen to you. (Many missionaries have been killed or hurt by wars and organized crime, for example.) 2. If you are committed to the cause of Christ, you are promised persecution. 3. If you put yourself in places where bad things happen to lots of people as a result of general brokenness--for example, hurricane-prone places with poor infrastructure, or disease-prone places with poor medicine--it's possible you will be impacted as well. When we keep all this in view, no one should think just because bad things happen to people, it's somehow their fault or the result of their sin. In fact, in my view (and Lewis's, if you read Screwtape Letters), it is the absence of suffering, not the presence, that may very well be a better indicator of the Enemy at work.